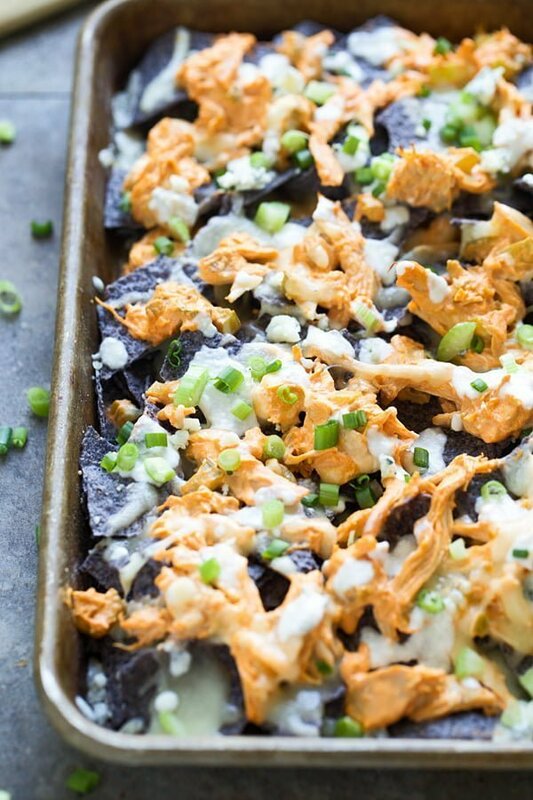 These Buffalo Chicken Dip Nachos take classic buffalo chicken dip and turn them into game day-worthy nachos that are totally addictive. I feel like there’s this unspoken rule in our house when it comes to football season – there must be buffalo chicken in some way, shape or form. 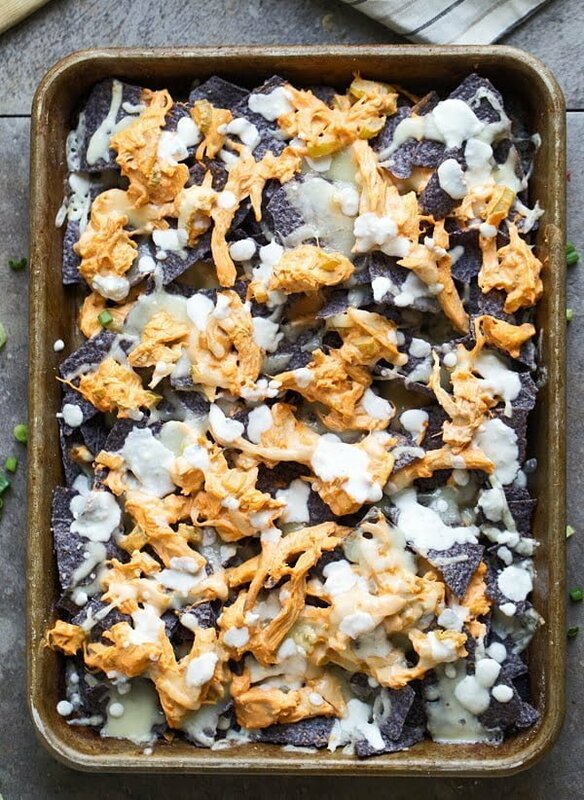 This year, I wanted something easy, I wanted something that didn’t require eating utensils and I wanted something even Teddy would enjoy, and that’s exactly what these Buffalo Chicken Dip Nachos are. While I devoured all the pieces heavy in blue cheese laden sauce, Kevin dug in to the pieces covered in spicy buffalo chicken, and the few pieces that only had gooey Monterey jack cheese on them and no sauce were reserved for the little guy who prefers his nachos practically naked – which isn’t too far off from his everyday mantra. Basically I made classic buffalo chicken dip in a skillet, spread it over a layer of blue corn tortilla chips, covered it in shredded cheese, repeated the whole process once more and then popped the whole thing in the oven just until the cheese melted. 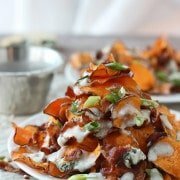 Once the nachos come out of the oven they’re drizzled with a two-ingredient blue cheese sauce, sprinkled with chopped green onions and celery and they’re ready to be served. My method for buffalo chicken dip is pretty simple. I just cook a little celery in some butter and then add in a few cups of shredded rotisserie chicken (you could also cook up your own and shred it), plenty of Frank’s hot sauce and a few ounces of light cream cheese. Once the cream cheese melts and everything comes together, it’s either ready to be served in a bowl, or in today’s case, ready to be smothered over tortilla chips. Also, I wouldn’t label myself as a hot sauce connoisseur, but I do prefer Frank’s over any other. 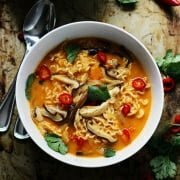 For me, it’s hot without completely incinerating my taste buds, and it has this awesome almost vinegar-like taste to it that I love. Kevin turned me on to it when we first started dating, and it’s been a fridge staple ever since. I know some people have strong feelings on blue cheese versus ranch when it comes to wings, we happen to be a house divided with Kevin leaning towards ranch and myself leaning towards blue cheese, but since I’m the one who prepares all the meals, blue cheese reigned supreme here. 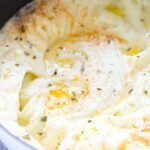 The blue cheese sauce requires only two ingredients – blue cheese and heavy cream. – and couldn’t be easier to make. While the nachos are cooking, the cream is simmered until it’s thickened a bit, and then crumbled blue cheese is whisked in until it’s completely melted. 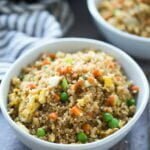 It’s seasoned with salt and pepper to taste and then it’s ready to go. Although these are perfect as is, I also like to serve them with a side of ranch, salsa and sour cream. And of course, beer. 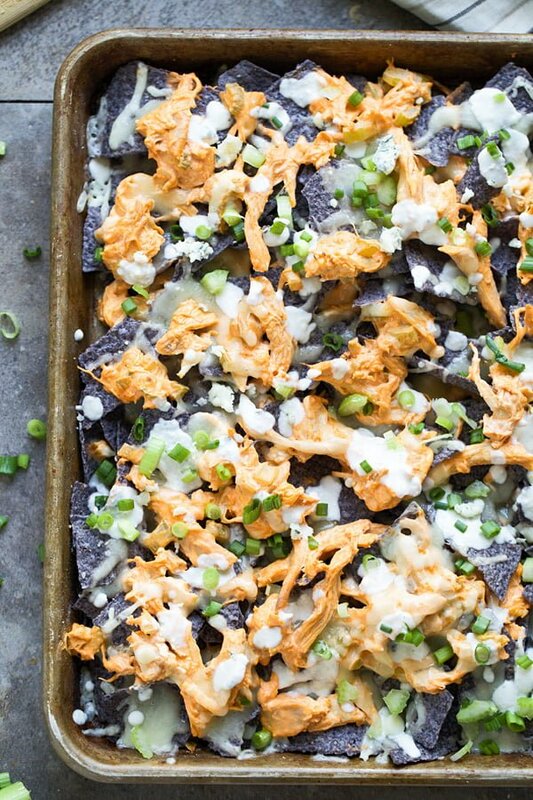 Buffalo chicken dip meets classic Mexican dish in these Buffalo Chicken Dip Nachos. 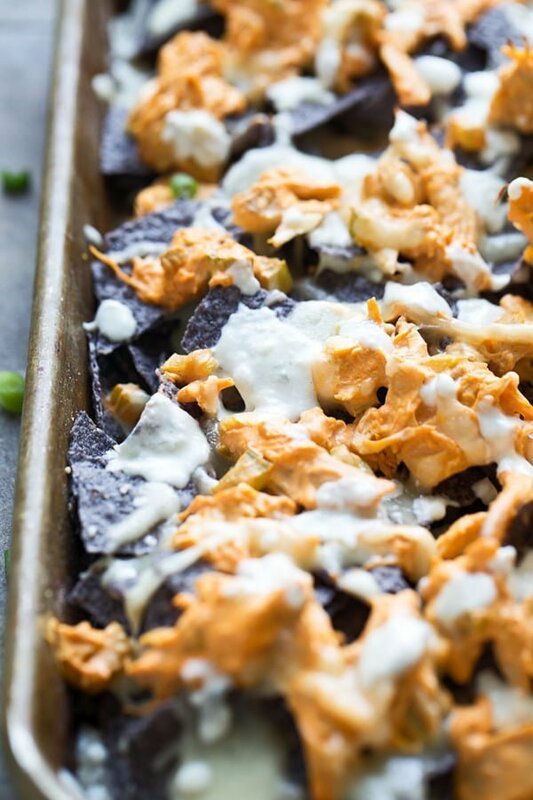 Blue corn tortilla chips are covered in a condensed buffalo chicken dip, smothered with mozzarella cheese and then drizzled with creamy blue cheese sauce. Preheat oven to 325 degrees. Grease a half baking sheet with non-stick cooking spray. Heat a medium skillet to a medium heat. Add butter and celery. Sweat celery until slightly softened, about 3-4 minutes. Do not brown. Add shredded chicken, cream cheese and hot sauce. Stir until cream cheese has melted and the ingredients are mixed together. Turn heat off. Season with salt and pepper. Spread half of the chips on the bottom of the pan. Dot half of chicken mixture on top. Sprinkle with half of the cheese. Place the remaining chips on top, followed by the remaining chicken mixture and then remaining cheese. 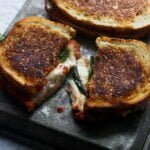 Pop into the oven for 5-10 minutes until cheese has melted. While nachos cook, add heavy cream to a very small saucepan, bring to a boil and reduce to a simmer until slightly thickened, about 2 minutes. Reduce heat to low and add 1/8 cup of blue cheese. Whisk until cheese has melted. Season with salt and pepper. When cheese has melted on nachos, remove from oven. Drizzle with blue cheese sauce and sprinkle with green onion. 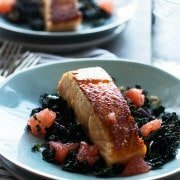 Serve with sour cream and salsa if desired.